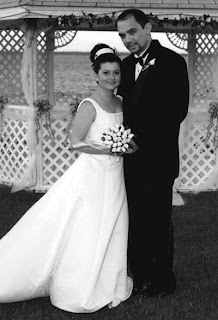 Jon & I celebrated our seventh wedding anniversary quietly at home tonight. Since we are going to see Cirque Du Soleil on Friday, we decided that we should just stay home tonight and take it easy. But since I am a sneaky snake, I snuck out this afternoon and visited our local world food market and Jon's favorite liquor store, Friar Tuck's. What resulted from my little excursion was a delectable Middle-Eastern feast topped off with a buffet of his favorite imported beers. We had lemon hummus with pita bread, spinach pies, Greek AND Bulgarian feta cheese (the Bulgarian one was way tastier!) and finished off with a selection of Lebanese baklava that was too die for! Of course, what put a HUGE smile on his face was the libations. He even took a picture of one of the bottles with his camera phone just so he could email it to his friend, Todd, who is also a beer enthusiast. The girls and I decorated the table with fresh flowers, candles and colorful place mats. The beautiful sunset shining through the kitchen nook window provided the most perfect backdrop for this anniversary celebration. Awww, Patty! Congratulations! My anniversary is in February, too (the 22nd). Sounds like you had a lovely evening! 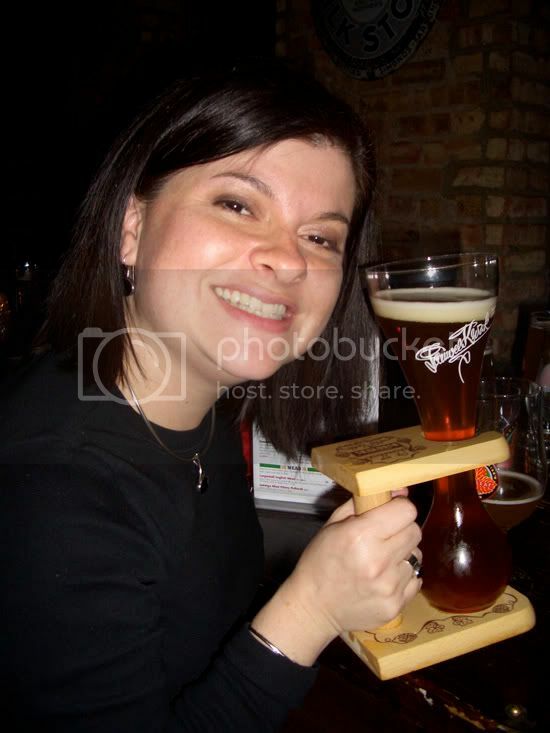 I love the pics - which beers did you try? I LOVE beer too..we stopped at a custom beercrafters 1/2 hr from our house on Sat fter skiing and sampled their tasty treats, then bought 2 growlers for home! Thanks for the warm wishes, everyone!